Thank you for your interest in the Housing Choice Voucher program! You can earn market rate income while helping low income families, and helping your community! At the Housing Authority, we are committed to providing excellent customer service to our landlords! Please take our brief landlord survey and let us know how we are doing. Your feedback will assist us in serving you better. 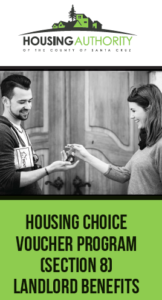 There are lots of benefits for landlords that participate in the Housing Choice Voucher program (Section 8). Convenient features for busy landlords such as single primary point of contact, web portal, walk-in hours, and more! Here’s a brochure that details these benefits. Finally, our newest benefit may be our best yet: the Landlord Incentive Program! This program serves landlords with rental units through-out Santa Cruz County, including the cities of Santa Cruz, Watsonville, Capitola, and Scotts Valley. Landlords can make claims for reimbursements – up to $2,500 for damages, unpaid rent, legal costs and vacancies. Click here to learn the conditions and options. If you would like to add your vacant unit to our free rental listings, go here. This program provides rental assistance to low income individuals and families. This program offers a good reason for landlords to accept Housing Choice Vouchers. The following forms are for landlords participating in the Housing Choice Voucher program. Download the direct deposit authorization form.